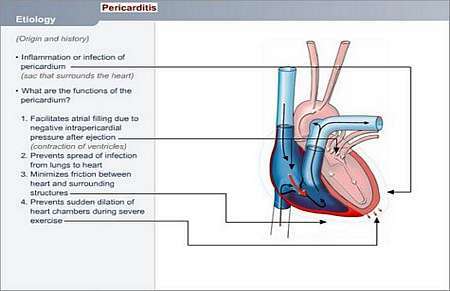 What is PERICARDITIS (Infection of the heart sac)? The pericardium is the sac that surrounds the heart. 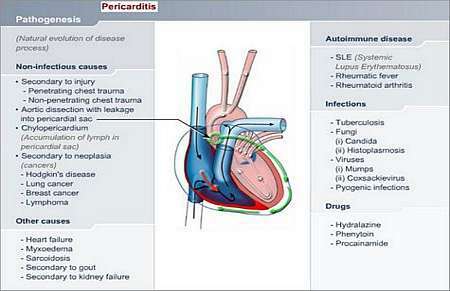 Inflammation or infection of the pericardium is called pericarditis. Why does this happen and how may it affect the patient’s health? 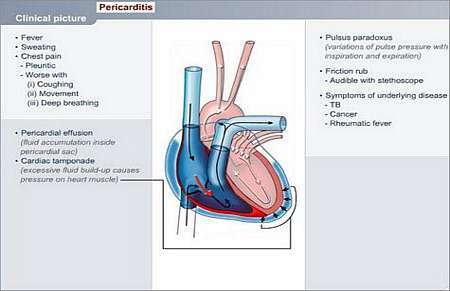 There are many conditions and illnesses that may cause pericarditis, e.g. Tuberculosis is known for causing a constrictive pericarditis. The infection inhibits normal contraction of the heart. It almost smothers the heart due to outside pressure. The patient may present with fever (not always present), sweating and pain in the chest. There may be an effusion (abnormal fluid accumulation) in the pericardial sac, causing pressure symptoms on the heart (tamponade). Pain is aggravated by coughing, movement, or when taking deep breaths. When the doctor listens to the heart sounds, there may be abnormal sounds like a friction type noise (friction rub). It is most important to identify and treat the underlying condition that caused the pericarditis in the first place. Corticosteroids may be given to patients who do not respond to NSAIDS or for specific conditions such as SLE (systemic lupus erythematosus). It may be necessary to tap (remove) fluid accumulating in the pericardial sac, surrounding the heart, in order to prevent pressure from the fluid build-up to compress the heart and compromise (inhibit) the heart muscle from contracting and dilating. The prognosis depends on the underlying causative condition and the extent to which the cause can be treated successfully, and prevention of further damage to heart tissues.